Virtual Currency settings are used to run rewarded ad units (Rewarded Video and Offerwall). 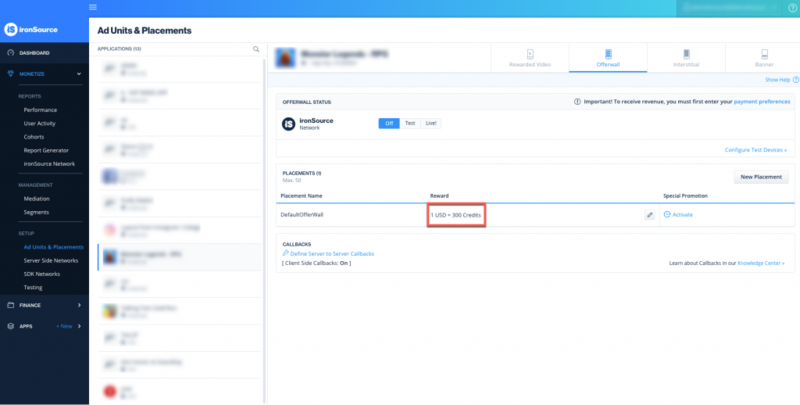 Each time a user completes the advertiser’s offer, the user is rewarded with your in-app currency according to the conversion rate defined on your Supersonic dashboard in USD. The Virtual Currency fields cannot be left empty. If your app doesn’t need a virtual currency, or you are not serving rewarded ad units, you can leave the default values. Virtual currency can only be set for Offerwall ad unit. Rewarded video will be set with Virtual item. You will see a DefaultRewardedVodeo or DefaultOfferwall placement that you can edit or you can add a placement by clicking ‘New Placement‘. Click the ‘Edit’ icon to change the reward configurations. Currency Name – The name of virtual currency defined on your Ad Placement. Select the currency you would like to edit. Conversion Rate – The amount of virtual currency your user will get for every 1 USD ironSource pays you. Select the conversion rate. • In the example above, the user will get 200 “credits’ for every 1 USD we pay you. • We don’t recommend setting the conversion rate below 1:100, as this may result with a user not being awarded any virtual currency once the ad completion payout is low. 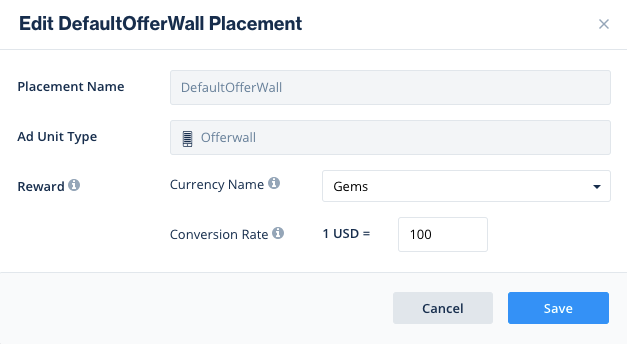 Your Offerwall is now set up with your defined virtual currency.